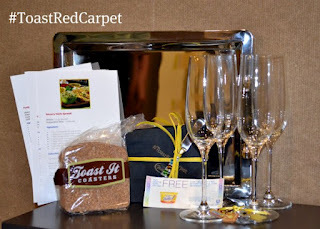 The first thing I will mention is: I won the Giveaway from Crazy for Crust. Dorothy shot me an email saying I won. Turns outs, Dorothy lives fairly close to me.....small world indeed! Please take the time and visit her blog. She has lots of great baking recipes. The Giveway is from, I can't Believe It's Not Butter. They had an online viewing party hosted by Brooke Burke, Carson Kressley and Molly Sims. So, on to my Spring post. 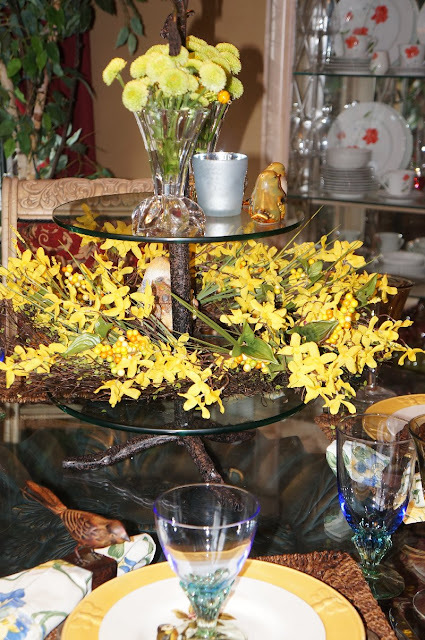 It's feels like Spring, so I thought I would set a Spring Tablescape. 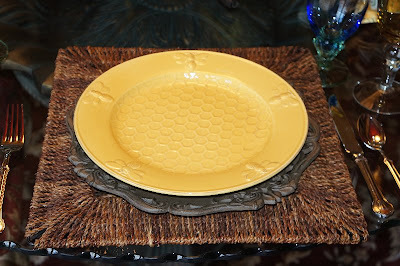 I am using my yellow Bee plates from Horchow and the Birds plates from Ebay. The Birds plates are by Royal Stafford. I bought this Bird stand at Save-on Crafts. It was on sale. It's the centerpiece for this table. 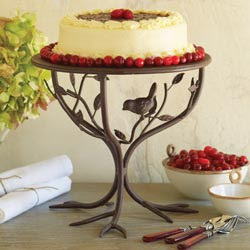 Here is the Bird cake pedestal to match. Bee plates are from Horchow. I don't think they carry them anymore. 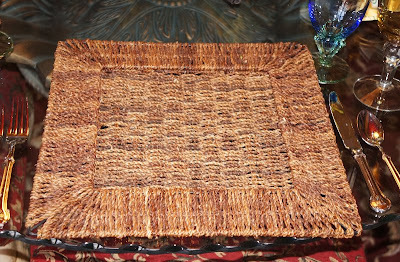 These placemats are from ZGallerie. In the previous post, I mentioned the wrought iron look chargers. 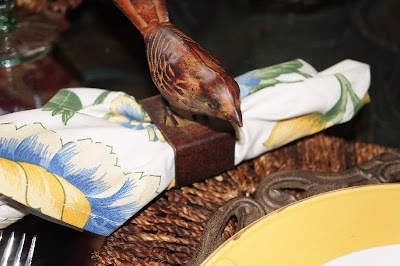 The bird napkin ring, I found at Zgallerie. The flowers are Glitter Mums I bought at our local Safeway. The little green birds are salt and pepper shakers. I am using a silk wreath for added color. It's sitting on the second tier of the bird stand. The Mums are sitting in my crystal candlestick holders. I turned them upside down for the flowers. It works perfectly. The little bee is sitting in one of the candleholders. My next post will be the lollipop tree my husband built and I finished. It turned out so cute! It will be on the candy buffet for the wedding in March. Again, thank you all for visiting and hopefully Happy Spring! So pretty Linda. My Mom would adore those bird plates too. Your blog is looking fun! You have a fun blog and congratulations on winning the giveaway gifts. 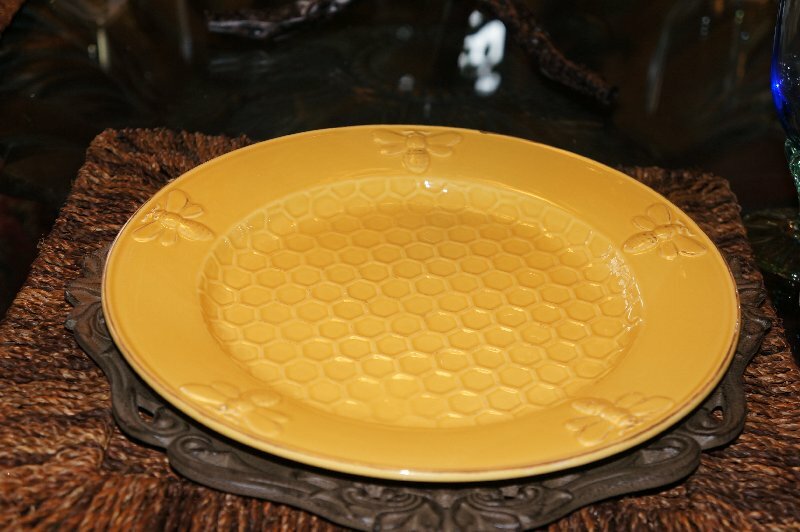 Love all the sweet birds and your bee plate. Your Spring tablescape is just beautiful. Love, love, love all that is birdies...so you know I am ooohing and aaaahing over everything. Happy March. 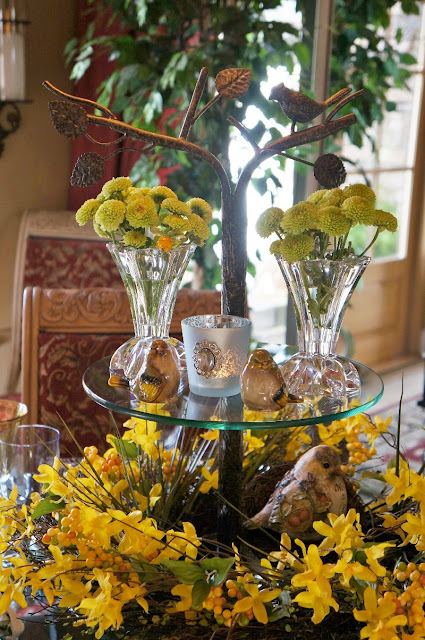 I also love your Spring Tablescape with all the sweet birdies. The dishes on the wrought iron chargers are to die for Gorgeous. I would love to have them. Congratulations also on your Beautiful gift you are so lucky. I hope you and hubby have a wonderful dinner. 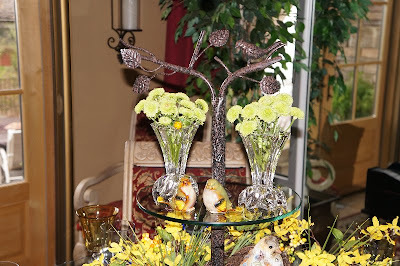 Love your birds and the bees table!! I adore anything with bees and have started a little collection of my own. Such gorgeous colors and so springy! 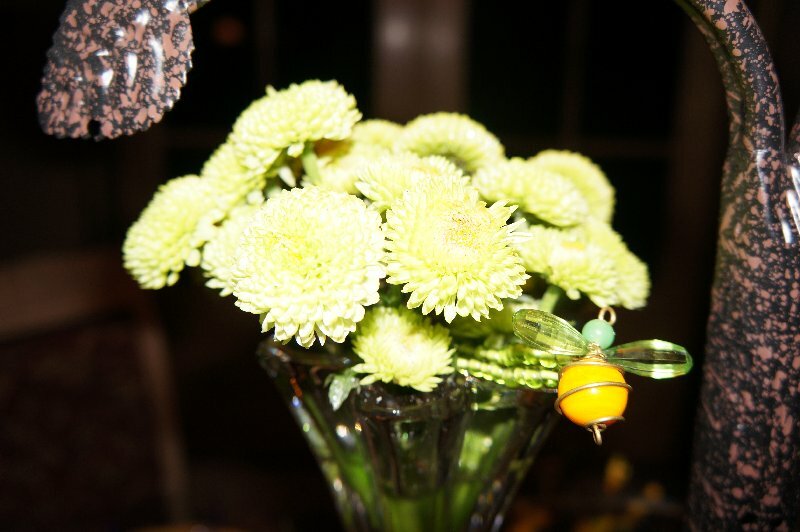 Love your centerpiece too! Thanks for sharing! This is so pretty! I'm a little envious of your bird stand...that is SOOOOO cute! I want one! =) I have a thing for bird items! I have the same flatware too! 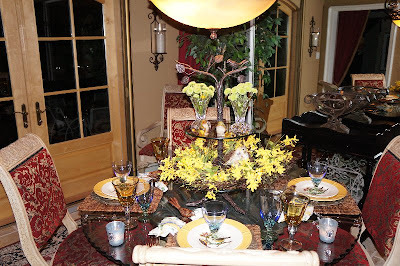 What a fun table...love the bird napkin rings, they are adorable. Fabulous centerpiece. Hey, Linda! 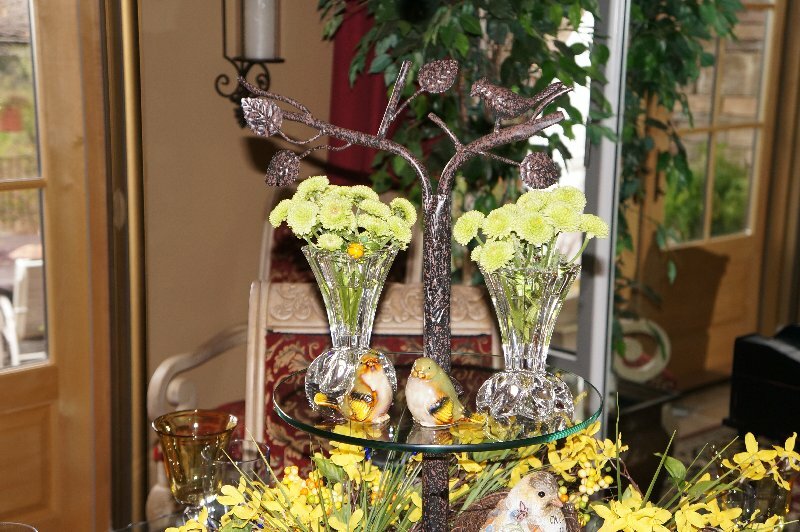 That centerpiece stand is the hot diggity bomb!!!!! Love it! I can think of 1000 things I could do with that bad boy!!! You have turned it into a great springtime look with the forsythia and flowers and figurines...great! 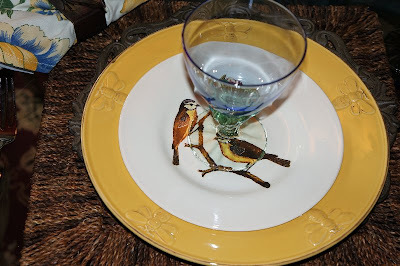 LOVE the bird salad plates, too! They really work well with your dinner plates. If ever you have to have "the talk" with a child about the birds and the bees, this is the luncheon table to sit them down at to do it!!! :-) How's the planning and decor for your cousin's wedding going? Just a few more weeks now, right? Beautiful! I am not a crafty / designer like this... mine would have looked like my 6 year old grandson did it! Thanks for visiting me at A Season for All Things. I'm your newest follower and look forward to finding more great ideas to use (on a more simplified note)! Your table is just stunning, Linda! That bird cake stand is incredible. I've never seen anything like it before. You did such a lovely job. Thanks so much for stopping by my blog. The twisted flowers were really fun, & now that I know how to do it, I'll be making some more.